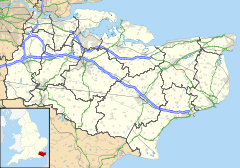 Maidstone Barming is a civil parish in the Maidstone District of Kent, England. It lies to the west of Maidstone, the county town, and had a population of 2234 persons (2001 census). The eastern end of the parish is part of the built-up area of Maidstone, although the remainder is much more rural. The River Medway is the southern boundary of the parish. Barming is mentioned in the Domesday Book, and was then described as being divided into East and West; the latter being known as Little Barming, and having its own church until the 16th century. Barming Primary School dates back to 1854 but is not now located on the original site. Barming railway station, on the London /Maidstone/ Ashford route, was opened with the line on 1 June 1874 but is not actually located in the parish. It lies 1 mile to the north and is in the neighbouring borough of Tonbridge and Malling. The railway station named East Farleigh lies in Barming parish, at the extreme southern boundary adjacent to the River Medway. This is on the scenic Medway Valley Line linking Strood, Maidstone and Paddock Wood. The A26 road crosses the parish. Local bus services are provided by Arriva Southern Counties and Nu-Venture. Surrounded by peace and tranquility the church was built in the Norman period (12th Century) and has a characteristic triangle of east windows and a tower in the perpendicular style has been added. The Church is Grade II* listed and some of the gravestones are Grade I. Amongst many items that you can see are three bench ends made in Germany in 1300. Inside the churchyard is a mounting block - four stone steps built in the 19th century to help riders to mount their horses. At 7.15 p.m. on 1 May each year, local morris dancers Kettle Bridge Clogs  dance across Barming Bridge (otherwise known as the Kettle Bridge) which spans the River Medway at the southern end of South Street. This event marks the official start of their morris dancing season. ^ "Maidstone Barming CP". Neighbourhood Statistics. Retrieved 2007-08-20. ^ "Civil Parish population 2011". Neighbourhood Statistics. Office for National Statistics. Retrieved 14 September 2016. This page was last edited on 15 December 2018, at 12:03 (UTC).